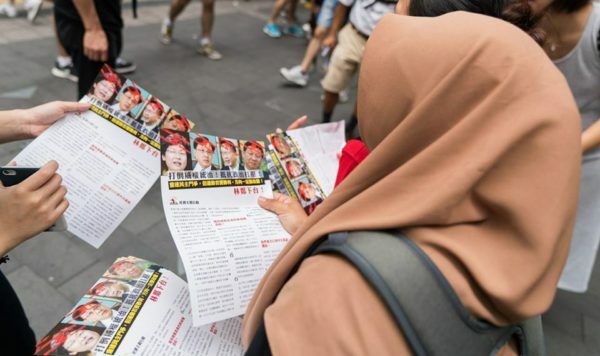 The Stop Repression in Hong Kong campaign was launched to highlight the rapidly worsening attacks on democratic rights by Hong Kong’s government. Socialist Action initiated this campaign in consultation with left organisations and worker activists in several countries. Key assistance has been given by the Committee for a Workers’ International (CWI), the international socialist organisation with parties and groups in 40 countries. In October, protesters in 22 cities around the world – from Bangalore to Vancouver – answered the call of the campaign to demonstrate outside China’s embassies. 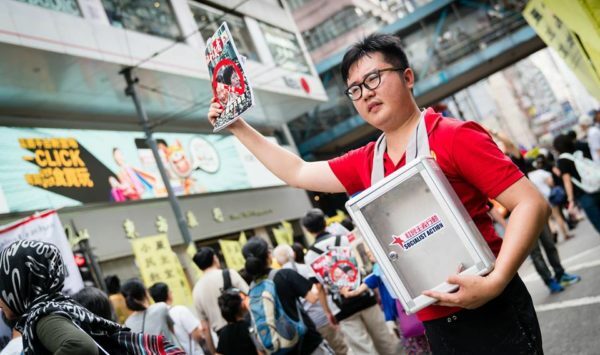 Socialist magazine on sale at July 1 pro-democracy demo. The great crackdown of 2017 has seen six legislators undemocratically ejected from Hong Kong’s Legislative Council (Legco), giving the pro-government parties a ‘super majority’ that enables them to rewrite the Legco rule-book in their favour. This is not at all what the voters wanted in the September 2016 Legco elections, when the pro-government camp suffered one of its biggest defeats in terms of votes. In that election the combined opposition parties got 60 percent of the vote, an increase from 56 percent in the elections of 2012. This was obtained on the highest election turnout for two decades. The establishment’s purge of the Legco has nothing to do with ‘rules’ or ‘oaths’ – that was a legal smokescreen created by the Chinese dictatorship and its Hong Kong puppets. Its real purpose is to attack the most radical voices in the democracy struggle, such as ‘Long Hair’ Leung Kwok-hung, and try to eliminate these forces from the struggle. This will not succeed and can actually blow up in the government’s faces, increasing public support for the ‘radicals’. Under Beijing’s pressure, which ultimately reflects its fear of mass radicalisation spreading from Hong Kong to China, the news media in Hong Kong is increasingly a megaphone for China’s dictatorship. Reporters Without Borders lowered Hong Kong’s press freedom ranking in 2017 to 73 (out of 180 countries). This ranking has been falling year after year since 2002, when Hong Kong was ranked 18 in the world. China is ranked 176, the fourth worst in the world. “Beijing has also become more, not less, hardline on Hong Kong,” noted Human Rights Watch in a September report (Three Years After Umbrella Movement, Hong Kongers Soldier On). On November 4, China’s fig-leaf parliament, the National People’s Congress (NPC) Standing Committee adopted new legislation that criminalises ‘disrespect’ of China’s national anthem, March of The Volunteers. This is now punishable by up to three years in prison. Only days later the NPC Standing Committee inserted an amendment into Hong Kong’s mini-constitution (Basic Law) which extends the new law to Hong Kong. This is particularly aimed at the younger generation and Hong Kong football team supporters, where the influence of the anti-China nativist movement is strong. Socialists completely oppose this draconian legislation which is a further blow to freedom of speech and the right to protest in Hong Kong. We predict it will backfire on its authors by creating an even bigger mood of revolt against the Chinese regime. 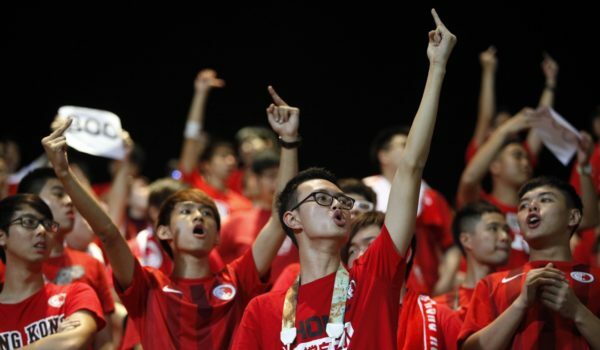 Hong Kong football team supporters protest during Chinese national anthem. The Hong Kong government’s attacks include increasingly blatant manipulation of the courts, which have previously – based on an appearance of political neutrality – provided a degree of political stability for the capitalist regime. The effectiveness of these and other political reserve weapons are being eroded by the current government’s authoritarian policies. In August, 16 youngsters were jailed for up to 13 months for their role in different mass protests. Probably we will see more political prisoners as a result of dozens of political trials which are planned. In August the Department of Justice said 225 people who were arrested in connection with the 2014 Umbrella protests are facing judicial proceedings. 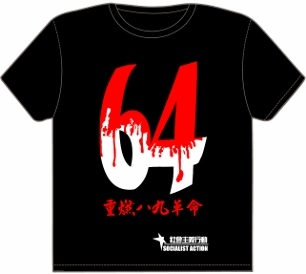 Of these there are at least 48 prominent activists including Benny Tai Yiu-ting and other ‘Occupy Central’ leaders. Masquerading behind ‘rule of law’ the government has deliberately increased the severity of the charges against these prominent figures, from “unlawful assembly” which carries a maximum penalty of five years in prison, to “inciting people to create a public nuisance” with a seven year maximum. The government overturned court rulings in the cases of the 16 young activists, who include former student leaders Joshua Wong Chi-fung and Nathan Law Kwun-chung, forcing through its own demand for prison sentences as a ‘deterrent’. Its aim – to frighten others from protesting – is absolutely transparent. “The justice department’s outlandish application seeking jail time is not about public order but is instead a craven political move to keep [Wong and Law] out of the Legislative Council, as well as deter future protests,” warned Human Rights Watch. This is absolutely correct, but it is not just about the Demosisto leaders Wong and Law. The government has pushed for jail sentences to remove others from standing in elections such as Raphael Wong Ho-ming of LSD who is serving a 13-month sentence. This is a plan to screen out, disqualify, and financially strangle the more radical pro-democracy parties and groups. But this authoritarian masterplan can and will be defeated through mass resistance. Socialists stand for building a fighting grassroots democracy movement based on the working class majority and linking up with the working class in China and throughout Asia. The power to win democratic rights comes from mass working class struggle – against dictatorship and capitalism – not from capitalist governments who have largely embraced the authoritarian ways of China’s rulers. Release the political prisoners in Hong Kong and drop the charges against democracy activists! Protests the disqualification of elected legislators – use the 2018 Legco by-elections to build mass resistance to government repression! 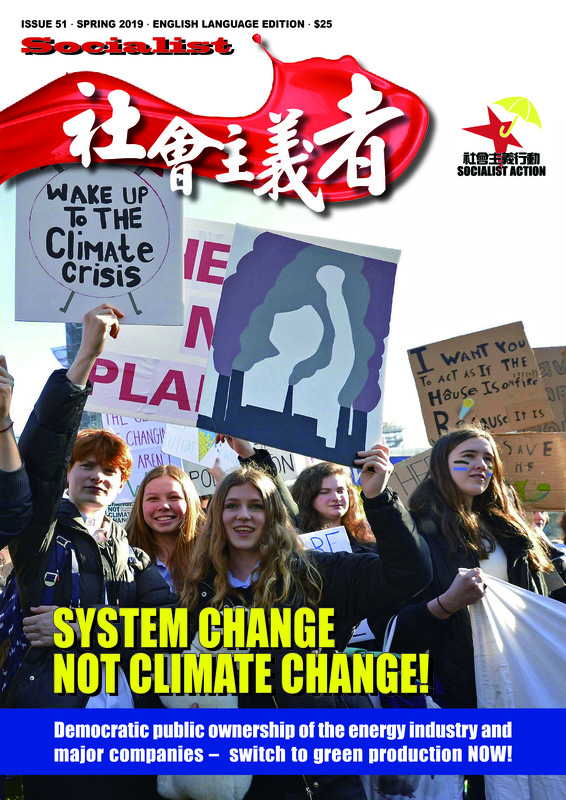 International grassroots solidarity – capitalist governments and politicians have been bought by the Chinese dictatorship, but the people are on our side! August 20, 140,000 march against jailing of young activists – Socialist Action distributed 5,000 leaflets calling for student strike and mass resistance.